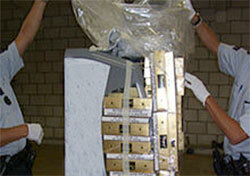 the highest number of seized cigarettes in the world. Europe is the Region which would profit the most, if the illicit trade were eliminated. The availability of cheap illicit cigarettes increases consumption and tobacco related deaths. Eliminating or reducing this illicit trade will therefore reduce consumption by increasing price and thereby decreasing premature deaths. An estimate for the illicit cigarette market in Europe varies between 6% and 10%. If illicit trade were eliminated in Europe, governments would gain additional revenue. To address these crucial issues, it is, therefore, of highest priority that all governments in Europe ratify the Protocol to Eliminate the Illicit Trade of Tobacco Products as an important means for countries to increase revenue as well as reducing tobacco-related mortality and morbidity. As of March 2015, the European Member States, Austria, Spain and Turkmenistan, are among the first 6 Parties globally to the Protocol to Eliminate Illicit Trade in Tobacco Products – the first protocol of the WHO Framework Convention on Tobacco Control (WHO FCTC). Twenty countries from the European Region and the European Union (EU) have signed the Protocol (globally 54 Parties to the WHO FCTC have done so).